Bond International School, Sri Lanka, has agreed to provide a discount to Maldivian students. 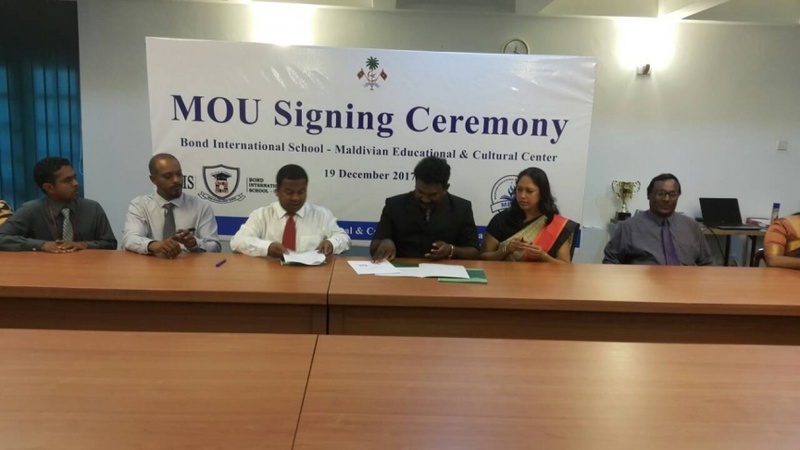 The agreement for the arrangement was signed between Bond International School and the Maldivian Education and Cultural Center (MECC) run b the Maldivian Embassy in Sri Lanka. Under the agreement, students applying for Bond International School through MECC would receive a 25 percent discount from the admission fee. At the ceremony held at the MECC today, the agreement was signed by the Maldivian Ambassador to Sri Lanka, Mohamed Hussain Shareef and the CEO and Principal of Bond International School, Anandan Robinson. Secretary General of the Maldivian Embassy, Hussain Mazin said that the MoU signed today would bring a lot advantages to Maldivians. Aside from the admission fee, course fees can also be paid in installments as well. Bond International School has special classes for O'Level. The agreement signed today would give 25 percent discount for Maldivian students who want to join those classes. It is school that focuses on education with accommodating special needs students. The MoU also would help Maldivian students get internships in the field. MECC has previously made similar arrangements with Sri Lankan universities, Meteropolitan College and Spectrum College.